Distracted driving is no longer a minor concern for Canadian drivers. Legislators, educators and other experts alike agree that driving distracted is a serious matter of concern for public safety. 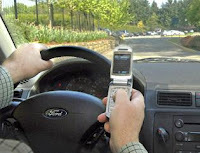 Distracted driving legislation is now on the books in nearly all Canadian provinces; in Alberta, home to some of the strongest distracted driving laws in the country, you can be fined up to $172 for the offense. It's hard to understate the dangers of distracted driving. Statistics show that 80% of collisions and 65% of near-collisions involved some form of driver inattention up to three seconds before the event. Distracted driving, which can involve anything from texting and making calls on your phone to eating and doing make-up, is a serious threat to drivers everywhere because it reduces reaction times in those critical moments before a possible collision. Your ability to notice threats as they come up, and your ability to react to those threats instantly, can be the difference between deftly avoiding a serious accident, and getting into one. If you don't think that using your phone in the car is a serious problem, consider that you are more than 25 times more likely to get into an accident while texting on your phone while driving, and more than 4 times more likely to get into a collision if you're making a call on your phone while driving. It's simply not worth the risk to drive distracted!